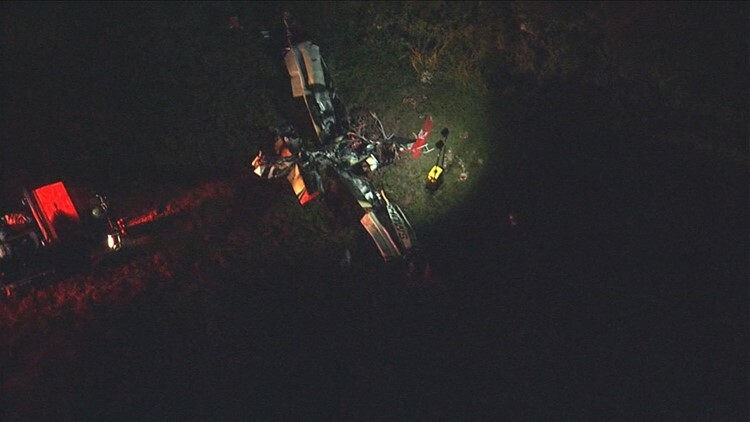 On October 12, 2018, about 2000 eastern daylight time, an experimental, amateur-built Vans RV-8, N804RL, was destroyed when it collided with terrain while maneuvering in Culpeper, Virginia. The commercial pilot was fatally injured. Night visual meteorological conditions prevailed, and no flight plan was filed. The local airshow flight originated at Culpeper Regional Airport (CJR) and was conducted under the provisions of Title 14 Code of Federal Regulations Part 91. The accident airplane was part of aerobatic team of two RV-8 airplanes that were participating in the Culpeper Air Fest airshow. According to the pilot in the lead airplane, they left Cincinnati, Ohio around 1000 on the morning of the accident and arrived at CJR at 1150. They rigged the fireworks and prepared the airplanes for the airshow. They finished about 1600 and waited in the fixed-base operator until the night portion of the airshow began. The pilot of the lead airplane stated that they had flown the night show routine on three occasions during the previous 30 days. The lead pilot also said that he was always in front and as the maneuvers progressed the airplanes would get further apart. The flight sequence was planned to last about 5 minutes and they were in the middle of the routine when the accident occurred. The maneuver was a double aileron roll and they were level with the horizon. A review of a video showed both airplanes performing the double aileron roll maneuver as the lead pilot stated. Both airplanes were observed in a shallow descent and after the maneuver was completed, the lead airplane began to climb while the accident airplane entered an inverted dive, which continued until it collided with the terrain. The single-engine, experimental, amateur-built airplane was manufactured in 2017, and powered by a Superior IO-360-series engine that was equipped with a Hartzell controllable-pitch propeller. At the time of the accident, the airplane had an airframe total time of 120 hours. At 2015, the recorded weather at CJR, included wind calm, 10 statute miles visibility and a clear sky. The temperature was 52° F, the dew point was 45° F, and the altimeter setting was 29.85 inches of mercury. Astronomical data from the United States Naval Observatory for Culpeper, Culpeper County on October 12th indicated that sunset was at 1838, and the end of civil twilight was at 1905. At the time of the accident, both the sun and moon were more than 14° below the horizon. The lead pilot said that they had performed in darkness before, but "this one was a little bit on the darker side," so they elected to fly at 700 ft above ground level (agl) instead of their usual 500 ft agl. Examination of the accident site revealed that the airplane came to rest 300 ft from the end of left side of runway 22. The wreckage was in a 5 ft deep crater, inverted, on a 22° magnetic heading and all flight control surfaces were found at the accident site. The wreckage was severely fragmented and deformed. All necessary components for flight were accounted for at the accident site. The fuselage was crushed and the main wing spar remained attached to the fuselage. The empennage was observed with all flight controls attached. All flight control cables and push pull rods were accounted for at the accident site. The cockpit and instrument panel were destroyed by impact forces. The left wing sustained impact crush damage throughout its span. The left flap was crushed and remained attached to the wing's trailing edge at all attach points. The flap was observed in the up/retracted position. The left aileron, which was bent, remained attached to the trailing edge of the wing at all attach points. The push rod control end was broken and separated from the aileron. The left elevator remained attached to the left horizontal stabilizer at all attach points. The outboard section of the elevator was fragmented. The elevator control tube remained attached to the elevator bellcrank. The left horizontal stabilizer remained attached to the empennage and was deformed through its span. The right wing sustained impact crush and fragmentation damage throughout its span. The right flap was crushed and remained attached to the wing's trailing edge at all attach points. The flap was observed in the up/retracted position. The right aileron, which was bent, remained attached to the trailing edge of the wing at all attach points. The push rod control end was broken and separated from the aileron. The right elevator remained attached to the right horizontal stabilizer at all attach points. The right horizontal stabilizer remained attached to the empennage and was deformed through its span. The vertical stabilizer was crushed and remained attached to the empennage. The rudder remained attached to the vertical stabilizer at all attach points and was also crushed. The rudder control cables were still attached to the rudder. Both the left and right main landing gear were impacted damaged, but they remained attached to the fuselage at all attach points. Aileron push-pull rods were attached to the right and left aileron bellcranks. The aileron push-pull rods had numerous breaks throughout the length of the rods. The elevator push-pull rod was attached at the elevator aft bellcrank, and at the elevator. The tube was crushed and fragmented forward to the cockpit. The push-pull rod from the bottom of the control stick to the forward elevator bellcrank was crushed. The rudder cables had tension overload-type separations at various sections throughout the length of the cables to the rudder pedals. The engine was crushed and remained partially attached to the airframe. The engine crankcase was cracked. The crankshaft was bent and could not be rotated. A significant amount of mud was compacted into the engine. The ignition system and parts of the fuel system were fragmented. The magnetos remained attached to the accessory section and were crushed. The ignition leads were broken away from both magneto towers. The vacuum pump separated and was not recovered. The fuel pump was separated from the mounting flange. The fuel servo was fragmented and the oil sump was destroyed. The propeller hub remained attached to the crankshaft and was impact damaged. Both propeller blades were separated from the propeller hub. One blade was fragmented and the other was broken at the hub root. 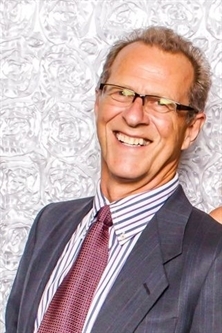 Jon Steven Thocker, 60, of Cincinnati, OH passed away tragically on October 12, 2018 in Culpeper, VA, while pursuing his love and passion for aviation. Born to Steven and Geraldine Thocker on November 7, 1957 in Lansing, MI; he graduated from Harry Hill HS and attended the Aviation Program at Lansing Community College. Jon fell in love with Deb in East Lansing and they married in June of 1982. They then moved to Cincinnati, OH two years later where they built their life together. Jon is survived by his loving wife of 36 years, Deborah (Giddings) Thocker, beloved children Alexander and Haley Thocker, loving mother, Geraldine Thocker, siblings Krisane Joslyn and Russ Thocker, many nieces, nephews, and extended family and friends. He was preceded in death by his father, Steven Thocker. A celebration of Jon’s life will be held on Tuesday, October 23, 2018 at the Waypoint Aviation Hangar at Lunken Airport - 4765 Airport Road, 45226. Arrival and welcome at noon, a tribute flyover at 1PM, followed by a service/celebration at 2PM. The celebration will be in an open-air hangar so please dress for the weather. Carpooling is encouraged, and space will be available at the FBO for aircraft parking. Jon touched many lives and cultivated countless relationships throughout his life. The family looks forward to sharing his story with all of you on Tuesday. Online condolences can be made at www.SpringGrove.org. Memorial donations can be made to the Jon Thocker Memorial Fund through any Fifth Third Bank location, at Paypal or Venmo. CINCINNATI — The local air show community is in mourning this weekend after losing one of their own. Jon Thocker, a Cincinnati pilot, was killed in a Virginia plane crash Friday night. Thocker, who possessed a lifelong passion for building and flying experimental planes, was well-known not only around Cincinnati but all across the country. According to Virginia State Police, his plane went down in a field in Culpeper County. In a statement today, Public Relations Director Corinne Geller of the State Police said "The preliminary investigation revealed that an RVA Homebuilt aircraft was conducting aerodynamic maneuvers when it crashed into the ground. 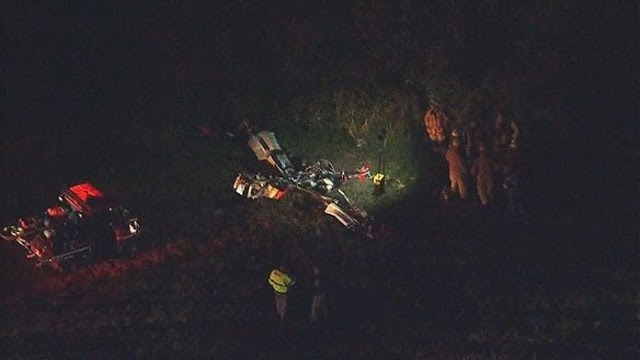 The crash occurred in a field in the 12,500 block of Beverly Ford Road in Brandy Station, Va., at approximately 8:10 p.m. The pilot, Jon S. Thocker of Cincinnati, Ohio, died at the scene. He was the plane's only occupant. The FAA and NTSB responded to the scene. No one on the ground was injured as a result of the crash." In 2014, Thocker described to us his RV-8 planes like the one that crashed Friday night. He built ten of them. "So, I do air shows", he explained at the time. "Certified as a two-ship formation team, Redline Air Shows. And also for a larger team, Team Aerodynamics." According to air show postings, Thocker and his partner, Ken Rieder, were each flying solo accompanied with pyrotechnic displays when Thocker's craft went down midway through the routine. Friends spoke to us today about their their exceptional skill, passion for flying and professionalism. Musician and pilot Rob Reider at an air show in Nevada told us he was heartsick by the news of his friend's death. "When a friend of mine whose plane I used to fly sold the airplane, I thought my flying days were over," Reider said. He described how Thocker and his partner encouraged him to give an RV aircraft a try. "Jon found an airplane for me. We flew to Scottsdale, Arizona. He inspected it, he test-flew it, we brought it back to Cincinnati." Reider credits Thocker's mentorship, thoroughness and caring with bringing the joy of flying back into his life. He further described how universally respected his work was. "Jon and Ken had the rare opportunity of flying in formation with the Blue Angels," he said. "It's a rare opportunity, a rare honor that the Blue Angels only afford to the best of the best." Another friend and air show photographer Dianna Lantz-Power related how she is haunted now by a conversation with Thocker this past July. "And he said I just hope that nothing, you know, I don't know what I would do if something happened to Ken, my partner. I don't know anything, I don't know what I would do if something, if kind of a tragedy happened to us," she recalled. She had just returned home from helping Hurricane Michael victims in Panama City, Florida Friday when she got word about the tragedy. "And I get the call that Jon had an accident," she said in a choked voice. "And I don't even know how to process it." In every conversation with those who knew him, the words Jon and Ken, Ken and Jon were mentioned as if interchangeable. They've flown with Redline as a team for a dozen years. We're told they were looking forward to featuring their new planes to close out the air show season and at the November 4th homecoming with the Blue Angels. Both practiced with regularity at the Butler County Regional Airport. Tom Hogan, who has space in the hangar next to Thocker, told us his death is tragic and affects the entire aerobatic aviation community. Thocker leaves behind a wife and family. Lantz-Power and Reider both could hardly get through the recollections of recently seeing Thocker, pausing to collect themselves. "I will always remember the way he greeted me," said Reider trying to steady his voice. "The way he greeted me, he'd say hello Rob Reider. Every time. And smile." He said Thocker's guidance and friendship meant the world to him. Same with Lantz-Power, who said she is proud "to have shown the beauty of what they do through her lens, to have watched them live the dream they loved". BRANDY STATION, Va. - The pilot of a small plane taking part in an air show was killed in a crash at Culpeper Regional Airport, authorities say. 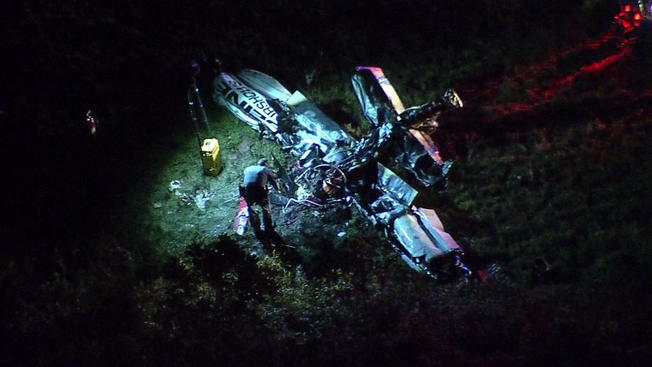 According to the Federal Aviation Administration, a Van's RV-8 aircraft crashed while the pilot was performing maneuvers at around 8 p.m. Friday. "During the night portion of the Culpeper Air Fest an aerobatic act experienced an accident," the Culpeper Air Fest said in a statement. "Emergency services that were onsite were dispatched immediately and are currently at work on the scene. It is too early to release any specific details at this time as there is an ongoing investigation. The educational portion of the Culpeper Air Fest for tomorrow morning will continue as planned, and as we get more details on the investigation we will make decisions on the remaining portions of the airshow. Our thoughts and prayers go out to everyone involved and we will update you as soon as we have further information." Virginia State Police, the Federal Aviation Administration and the National Transportation Safety Board responded to the scene to investigate what caused plane to crash. Police say they are still working on confirming the identity of the pilot. According to its website, the Culpeper Air Fest is the largest annual event in Culpeper and features the world’s only privately-owned Harrier, aerobatic aircraft and vintage warbirds. One person died in a plane crash near Culpeper Regional Airport on Friday, according to Virginia State Police. 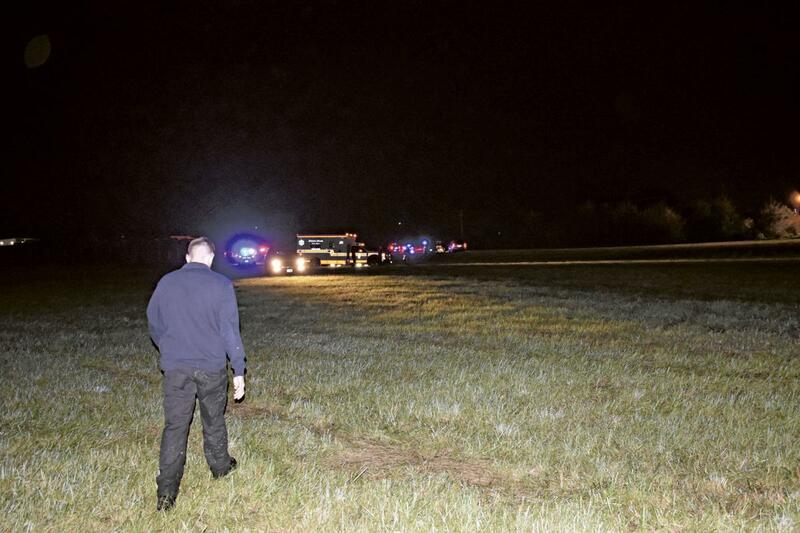 The small plane crashed around 8:10 p.m., Virginia State Police spokesperson Corinne Geller said. The Federal Aviation Administration and National Transportation Safety Board are responding to the scene to investigate what may have caused the crash. State police are still in the process of confirming the pilot's identification and notify next of kin. The accident took place as two Van's RV-8 planes were performing as part of a sponsor night air show as part of the Culpeper Air Fest, one plane crashed in the incident. The accident occurred at the south end of the airfield. The Culpeper Air Fest Committee provided an exclusive statement to the Culpeper Times. "During the night portion of the Culpeper Air Fest an aerobatic act experienced an accident. Emergency services that were onsite were dispatched immediately and are currently at work on the scene," the statement read. "It is too early to release any specific details at this time as there is an ongoing investigation. The educational portion of the Culpeper Air Fest for tomorrow morning will continue as planned, and as we get more details on the investigation we will make decisions on the remaining portions of the airshow. Our thoughts and prayers go out to everyone involved and we will update you as soon as we have further information." The Girls in Aviation program set for 8:30 a.m. at the airport Saturday morning is still scheduled to take place, with gates opening for the Air Fest at 9 a.m. Norm Laudermilch, Culpeper Air Fest Foundation Chairman said that the NTSB, FAA and Virginia State Police will meet with the Air Fest Committee Saturday morning to determine the whether the air show portion of the Air Fest will take place as planned. "We won't know until the morning for the flying portion," Laudermilch said. "We will let the public know via social media and our website." In 2006, pilot Nancy Lynn was killed when her Extra Flugzeugbau GMBH 300, N168EX, crashed during the Culpeper Air Fest. A small plane crashed in Culpeper, Virginia, Friday night, during an air show, killing the pilot, authorities say. Virginia State Police said the plane crashed just after 8 p.m. near the Culpeper Regional Airport. The plane was doing an "aerobatic act" as part of the Culpeper Air Fest, organizers said in a statement. The pilot didn't survive. No other injuries were reported. Organizers said the educational part of the Culpeper Air Fest will go on as planned on Saturday morning and that they would make decisions about the airshow as they get more details about the investigation. BRANDY STATION, VA -- The pilot of a small plane has died after a private plane crash near the Culpeper Regional Airport on Friday night. Sky9 was over the scene around 9:15 p.m. where a small plane could be seen surrounded by emergency vehicles. The pilot's identity has not been released at this time. The cause of the crash is unknown. The Culpeper Air Fest is scheduled to take place in the area on Saturday. On Friday night, the air show announced that an aerobatic act experienced an accident during the night portion of the show. The Culpeper Regional Airport is located on Beverly Ford Road. Vans and their ancient ownership, as well as the lack of maintenance are good targets for these accidents. Happens all the time! Nothing to see here folks, move on! #HangItUp! Just do a search here for Vans or other experimental aircraft commonly involved in these accidents and the truth will be told. This has been going on for far too long! It's literally death by pos owners and operators. What... not all capital letters? Why don’t you take a powder and lie down for a while? Maybe your head will stop hurting!